Ford's "Truth About Trucks" interactive kiosks, which showcase the F-150, are being installed at about 1,900 dealerships. DETROIT -- As of last week, there were far more 2015 Ford F-150s parked in lots surrounding the factory in Dearborn, Mich., than at dealerships. But even before the trucks arrive in larger numbers, some dealerships can give shoppers a good look at the redesigned F-150 with video kiosks. "Truth About Trucks" kiosks being installed this month in about 1,900 dealerships are part of a huge effort by Ford to educate consumers and salespeople, a testament to how crucial the F-150 is to the automaker and its retailers. 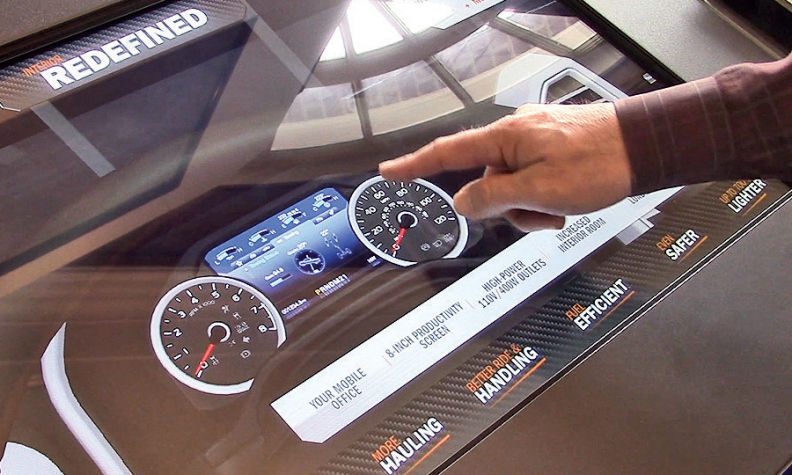 The $5,000 interactive kiosks promote the trucks' improved capabilities and fuel efficiency and show why Ford chose to use an aluminum body instead of steel. Ford is covering the cost of about 70 percent of the kiosks for stores that achieved "truck month" sales targets in September and October. "As much as we like to believe, as salespeople, that we're fonts of knowledge about everything, it's a lot to remember, and we've got other vehicles," said Bob Wheat, general manager of Village Ford in Dearborn, one of the first dealerships to get a kiosk. Ford has shipped about 5,000 units of the new F-150, though only a few hundred had reached dealerships by late last week, said Doug Scott, its truck group marketing manager. Scott said low gasoline prices won't change how Ford markets the F-150. "No matter what gas prices we've had," he said, "the number one unmet need for our F-series customers has been better fuel economy. Ford has been parking hundreds of F-150s around the Dearborn plant for extra quality inspections but said the checks have not delayed shipments.